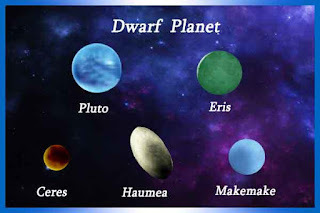 The dwarf planets are objects which are neither planets or satellites but orbits around the sun. The term dwarf planet was coined by Alan Stern in 1991 but was not adopted by the International Astronomers Union(IAU) until 2006. 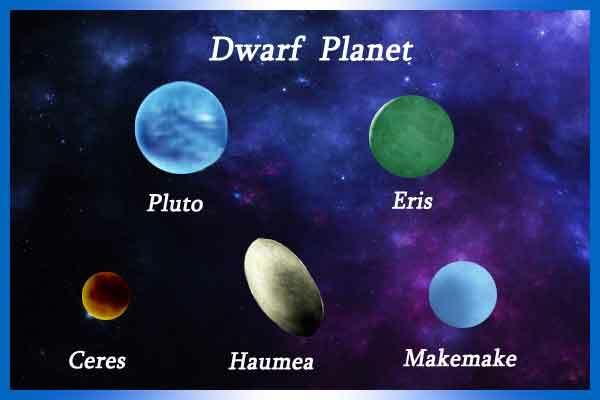 These objects has similar characteristics to the planets (Mercury, Venus, Earth, Mars, Jupiter, Saturn, Uranus, Neptune), but following the discovery of hundreds of these objects, the IAU unanimously agreed that the dwarf planets were no longer compatible with the other eight planets. 4.is not a satellite . Pluto was discovered on the Kuiper belt in Feb 18, 1930 by Clyde Tombaugh and was originally considered to be the ninth planet by astronomers. The Kuiper belt is a ring of bodies trailing Neptune. Pluto has five known satellites with Charon the most prominent. Pluto completes it’s orbit around the Sun in 248.00 years an equivalent to 90,560 earth days. Pluto was the first object to be discovered in the Kuiper belt and was originally considered a planet. However, the discovery of other objects of similar size in the Kuiper belt led to a reclassification of these objects which according to astronomers could number ten thousands in the future. In the actual sense, nothing about Pluto changed, but a redefinition of the term ‘planet’ brought about the demotion of Pluto from a planet to a ‘dwarf planet’. This is the largest of dwarf planets and was discovered in the asteroid belt by Giuseppe Piazzi (an Italian astronomer)on 1 January 1801. Composed of ice and rock, Ceres is too dim to see with the naked eye except under extremely dark skies. It is the only dwarf planet under the orbit of Neptune. This dwarf planet is the largest in the Kuiper belt and was discovered by a team lead by Michael E. Brown in March 31 2005. It was however not accepted as a dwarf planet by IAU until 2008. Makemake has only one known satellite with it’s surface harbouring ethane, methane and nitrogen ices. Makemake completes it’s orbit around the Sun in nearly 310 years, 62 years later than Pluto (248 years). Eris is the second largest dwarf planet. It was discovered in January 5 2005 also by a Michael Brown led team. Eris completes it’s orbit around the Sun in 203,830 days (558.04 yrs). With two known Satellites and an orbital period of 284.12 yr (103774 days) ,Haumea is the latest confirmed dwarf planet on the Solar system. Controversies still surrounds Haumea’s discovery as neither of Mike E Brown(2004) and José Luis Ortiz Moreno (2005) was given outright credit for the discovery. Haumea, though one of the largest objects with a greater average distance than Neptune .is smaller than Eris , Pluto and Makemake. Science corner continues to thrill! Share this post to your friends and classmates using the share button below. The contents above were compiled following an extensive research on the web and therefore represents sound information. Innovative Future however does not reserve any credits as the original source.